POEME: A Poetry Engine is an interactive installation that invites participants to create poetry through movement. We explore the relationship between bodily, mechanical, and digital interpretations of movement while referencing the choreographed routines of mass transit. Each participant receives a virtual ticket that grants them entrance to a private performance space. The participant's poems and sensor readings are conveyed outside of the space on a public display reminiscent of a departure board. The installation grew out of designing POEME, a website that allows users to create movement poetry with their mobile device. Cuykendall, S, Soutar-Rau, E., Schiphorst, T. POEME: A poetry engine powered by your movement. Proc. 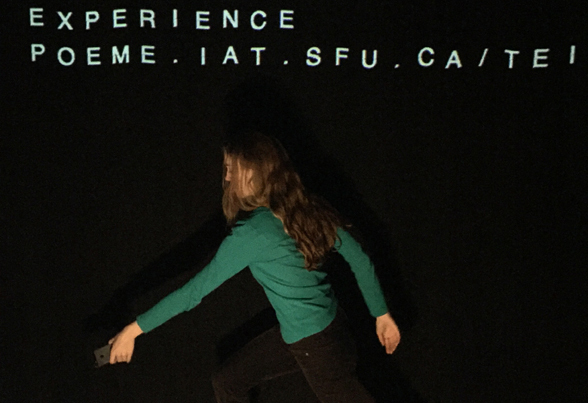 of the 10th International Conference on Tangible, Embedded, and Embodied Interaction. ACM, New York, 2016. In POEME: A Poetry Engine, movement is captured through a user's mobile device, such as a smartphone. Each participant is granted access to a private performance space behind a black curtain, where they can create poetry by moving.